Divergent accounts of the mudmen's genesis led two anthropologists to study their origins, thereby uncovering a range of cultural, political and economic complexities. (3) They revealed that Ruipo Okoroko, the Big Man in Komunive Village in the Asaro Valley, apparently conceived the idea of the mudmen in response to a request from organisers of the 1957 Goroka Show for Ruipo to 'display an aspect of his peoples heritage in the form of a singsing (dance) group for the tribal finery contest'. Ruipo's grandfather, Bukiro Pote, while living in another village, had learned the practice of 'bakime', in which the white sap of the 'meniha' tree was used to conceal the face of someone effecting payback. Returning to his village, Bukiro metamorphosed 'bakime' into the 'girituwai' – a snug-fitting mask fashioned out of bamboo, plant fibre and mud – to be worn during covert retaliation strikes against enemies. At the 1957 Goroka Show approximately 200 Asaro warriors stormed the arena donning these new masks and were promptly awarded first prize in the tribal finery contest. In addition to wearing the finely constructed masks, known as 'holosa' (ghost) in Asaro, the men were coated in clay – a shared expression of mourning across the highlands – and wielded spears, feigning attack on the crowd, who ran away in fright. 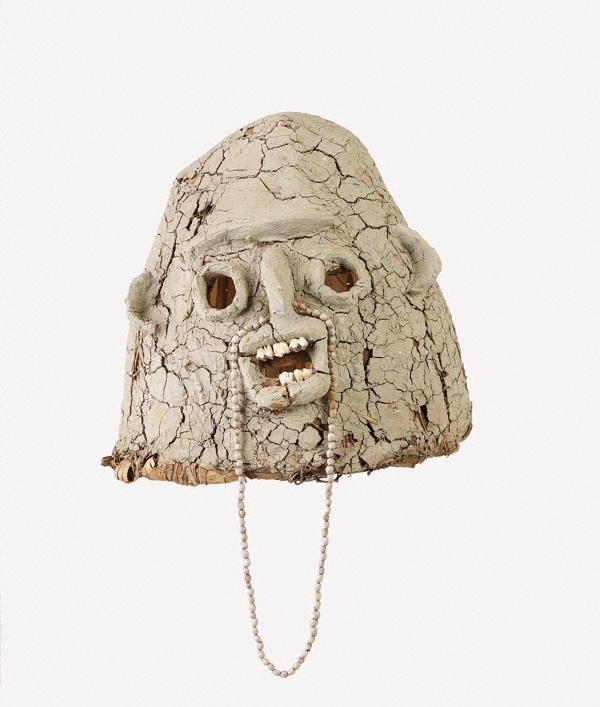 Natalie Wilson, 'Holosa (mud mask)', in Natalie Wilson (ed), 'Plumes and pearlshells: art of the New Guinea highlands', AGNSW, Sydney, 2014, pp 55–57. (1) See Sarah Boyd Blair, Mick Diener, Steven Lewis & Maria St John, 'Mudpeople there and here: three reports', The Drama Review (TDR), vol 31, no 4, winter 1987. In May 1970 Vogue photographer Irving Penn travelled to a 'mudman village' to photograph the fabled masked warriors. Photographs from his highlands experiences were published in 'The spectacular highlanders of New Guinea. Adornment: for gods, for love, for war', Vogue, December 1970. See also 'Archival material: Irving Penn Notebook A3, "Exposure log for Penn's trip to New Guinea", 1970', Art Institute of Chicago, www.artic.edu/aic/resources/resource/2122 (accessed October 2013). In the mid 1980s Sydney artist Micheal Graham's comic strip Mud-men of Oxford/King Street, with its humorous appropriation of the mudmasked figures populating the city's gay nightclubs, appeared in the music press. See 'Mud-men of Oxford/King St', critts.tripod.com/muddies/index.html (accessed October 2013). (2) Cynthia Nolan's book 'Paradise: and yet', Macmillan, London, 1971, was the result of her travels with her husband Sidney Nolan through the territories of Papua and New Guinea in 1965. (3) See Ton Otto & Robert J Verloop, 'The Asaro Mudmen: local property, public culture', The Contemporary Pacific, vol 8, no 2, fall 1996, pp 349–86, and Atairo Kanisuwo, 'Holosa', Paradise, no 89, November–December 1991, pp 31–36. (4) Thank you to Helen and Paul Dennett for bringing to my attention this alternative story narrated by Trevor Freestone in 'Teaching in Papua New Guinea', Xlibris Corporation, Bloomington, Indiana, 2011. (5) This fame has not been without consequence. Neighbouring groups have legally challenged Ruipo's claim to ownership of the creation of the masks and their accompanying performance, and over the decades other manifestations of the mudmen have appeared in surrounding areas. (6) In 1974, just prior to independence, the Asaro Mudmen performed for Queen Elizabeth II at the Goroka Showground. In March 2008 Australia's prime minister Kevin Rudd was farewelled on the tarmac at Goroka Airport by a group of mudmen, and in May 2013 prime minister Julia Gillard was greeted by mudmen at Parliament House in Port Moresby.